President Trump is dismantling some of America's most cherished national monuments, including Bears Ears and Grand Staircase-Escalante in Utah and the Northeast Canyons and Seamounts off the coast of New England. Many more are on the chopping block. We have never seen such a systematic and devastating assault on our treasured public lands and waters. And now, the president is opening these iconic places up to dirty, dangerous drilling and mining operations for profit. Bears Ears is already open to oil, gas, and uranium mining companies, threatening the monument’s unparalleled wildlands and wildlife, including 18 endangered species. Trump’s action ignores the voices of the five Tribes that consider Bears Ears their sacred homeland, leaving hundreds of thousands of cultural sites now vulnerable to looting and industrial destruction. Tell President Trump and Secretary Bernhardt to stop their assault on our public lands and maintain protections for America's cherished national monuments, public lands, and offshore waters. President Trump and Interior Secretary David Bernhardt are dismantling some of America's most cherished national monuments — opening them up to dangerous drilling and mining operations. Bears Ears National Monument is already open for business to oil, gas and uranium mining companies. 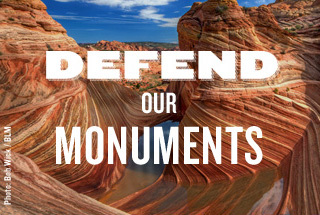 Tell President Trump and Secretary Bernhardt to stop their assault on our public lands and waters and maintain protections for America's monuments and wildlands. Dear President Trump & Interior Secretary Bernhardt: I am outraged by your illegal decision to dismantle the Bears Ears and Grand Staircase-Escalante National Monuments.,. I ask that you fulfill the mission of your agency by protecting America's public lands and waters and maintaining the integrity of monuments like the Northeast Canyons and Seamounts, and many others, and of the Antiquities Act itself. I urge you to reconsider your decision to roll back national monument protections, and preserve our public lands and waters and the boundaries that were already established for them.